Although D23 sold out on Friday and Saturday, and the lines for events scheduled for the D23 Arena required quite a bit of dedication, you could still get in on exclusive merchandise and events. After finding the right line and picking up your badge and then getting into another line for admission into the convention center, you already have a Aulani Disney Resort shopping bag in hand. D23 members were disappointed to learn that even with a gold, silver and free memberships, they weren't necessarily better off than the general admission public. The general admission line was shorter and faster, leading to some grumbling, particularly for those who had attended the first two D23 Expo events. On the Anaheim Convention exhibition floor you could wait in line for a free Disney Infinity game figure (We got Barbarosa) or special coins from Honda's ASIMO. 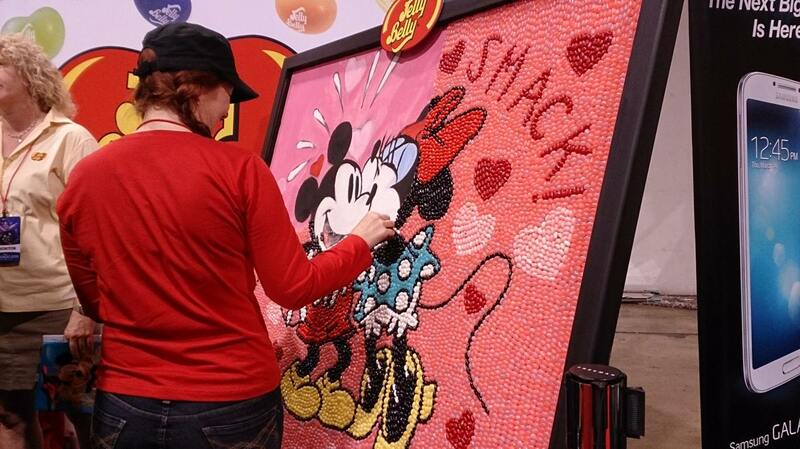 Jelly Belly Candy Company was giving away free samples as they made a Disney mosaic of jelly beans. In the morning you could visit the archives exhibit without waiting in the long afternoon lines. Items up for the silent auction were on display. 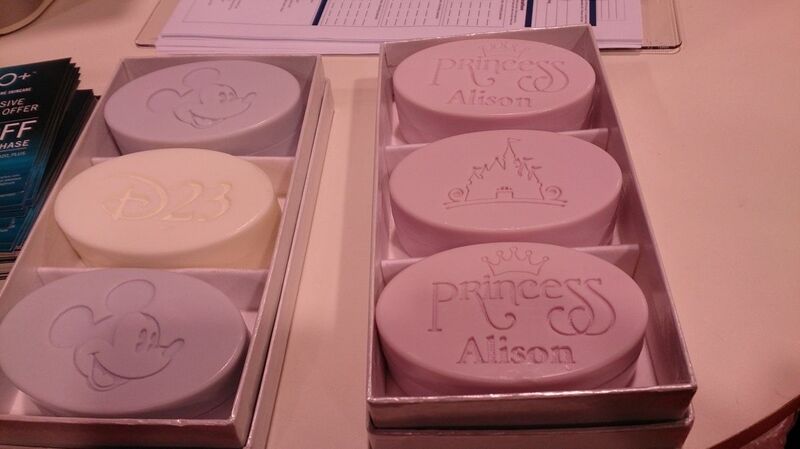 You could buy special commemorative soap from H20 Plus or a Minnie or Mickey Huffy bicycle. Or your could see the stars of many, many Disney Channel TV programs. You could hear the elated screams of young fans as their idols took to the stage. There was also a booth where you could get a Disney manicure or be introduced to a Disney makeup line. Collectors could buy more Disneyana or trade. If you're more interested in the art of comics, then D23, like San Diego Comic-Con has panels that give you a chance to hear from the top animators in the nation. Some of the animators were also available selling their art and/or signing autographs. Last time in 2011, we waited together and danced in line for two separate Stage 23 presentations: "Once Upon a Time" and "The Art of 'Brave.'" The "Brave" panel had free swag, but neither of the two Stage 23 presentations I attended this year offered even posters. Still there were plenty of seats left at the back and large screens allowed everyone to see the panelists close up. At the D23 Arena events that I attended (and in contrast to what I've heard about the San Diego Comic-Con dreaded Hall H), audience members were not given time for questions. At both of the Stage 23 presentations, the panelists took a few questions from the audience. The atmosphere was more relaxed in the Stage 23 presentations than in the D23 Arena events. 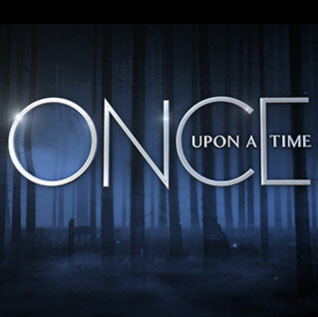 The Saturday panel discussion for ABC's "Once Upon a Time" and the spin-off "Once Upon a Time in Wonderland" gave fans a chance to grill show creators and executive producers Edward Kitsis and Adam Horowitz about the coming season. If you've been following "Once Upon a Time," the cast is now in Neverland; Kitsis and Horowitz revealed that the first half of the season will be in Neverland. Emma might be attracted to Captain Hook. Regina might find a love interest and Peter Pan might not be good. But good and evil are relative. Regina doesn't think she's evil. Again, we will see the tender side of Mr. Gold. The audience saw a clip in which, in Neverland, Mr. Gold is told, "The thing we haven't thought about in years still has the ability to make us cry." The theme for season three is that the characters must learn how to be their true selves. For the upcoming animated movie feature, "The Good Dinosaur," three panelists (Production Designer Daniel Lopez Muñoz, Character Art Director Daniela Strijleva, Set Art Director Noah Klocek) took us through the process of designing and filming a feature with two very different scales of reference. So what if 65 million years ago, that asteroid had missed planet Earth and the dinosaurs had continued to evolve and even formed an organized society and culture? Pixar decided to look at the herbivores who they proposed formed an agricultural society. The dinosaurs were farmers, much in the way of Midwest America in the 1930s. One artist related, "We wanted the farming to be supporting the family and not supporting industry." After looking at various dinosaurs and consulting with paleontologists, they chose five types of dinosaurs: apatosauruses, stegosauruses, triceratops, ankylosauruses and parasaurolophuses. Each was given a specific farm task. The appies plow the land; the stegs are the threshers; the trikes are the bulldozers; the anks are the trucks; and the paras are the pickers. Like all farmers—and I come from a farming family—these farming dinosaurs hate insects, the bad ones at least. One day a young appie named Arlo (voiced by Lucas Neff from TV's "Raising Hope") finds a peculiar insect. This insect, Spot, seems more complex and captures Arlo's imagination. Spot is an orphaned boy and together Arlo and Spot set off on an adventure into the wild. The artists considered everything from what the skin and color of a dinosaur should look like and how they should age to even how to make the dinosaurs easier for us humans to relate to. In their drawings, they tried to make dinosaurs look like their friends to bring out individual personalities. Looking at the sun-dried faces of old farmers, they incorporated wrinkle patterns and even patterned the skin coloration to subtly represent the beards of Midwest farmers. Looking at common farm crops, the artists compared them to the plant life present during the time of the dinosaurs and then created artistic hybrids to stand in for corn, etc. They wanted to have the patchwork effect you could see from aerial photos of Midwest farms in this dinosaur world. Yet the scale difference between an adolescent appie and a human child is so great, the artists had to consider the human scale and how what might seem like a normal scale for a large dinosaur would also look. They had to consider how to get Arlo and Spot on each other's eye level and how it would look when Spot was at ground level. The story is basically, "two kids having fun in the wilderness," but the artists also had to find a way to make Arlo vulnerable. "We still want it to be a challenge at every step." Audiences for the Saturday Stage 23 panel discussion and the Friday arena presentation about animation got to see sketches that have yet to be revealed to the public. Cameras and videos were not allowed. In the specific movie related panels, the audience was able to see the same footage revealed the day before at the arena event plus additional background art and 3D models as well as finished footage. There was plenty of room for people to hear about "The Good Dinosaur." 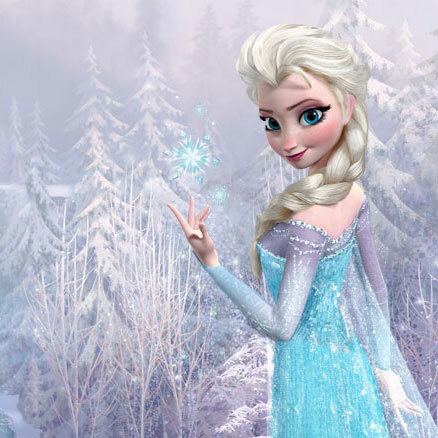 Other animation related panels included "Inside the Ice: The Art of Disney's 'Frozen,'" "'Toy Story OF TERROR!' and the Motivation Behind Pixar's Short Form Content," and "Women of Pixar." You could easily walk in to some of these instead of waiting in line, but in 2015, that might change with the addition of LucasFilms into the Disney family and the potential Star Wars market and fans coming together. I expect D23 to become more like SDCC in terms of crowds, while remaining more family-friendly (e.g. no booth babes) in terms of costuming and panel topics. Unlike SDCC, there aren't a lot of activities outside and the local companies haven't begun setting up shop to exploit the crowds although all badge holders get discounts at various local businesses. The next D23 Expo isn't until 2015, so many things can and will happen between now and then. 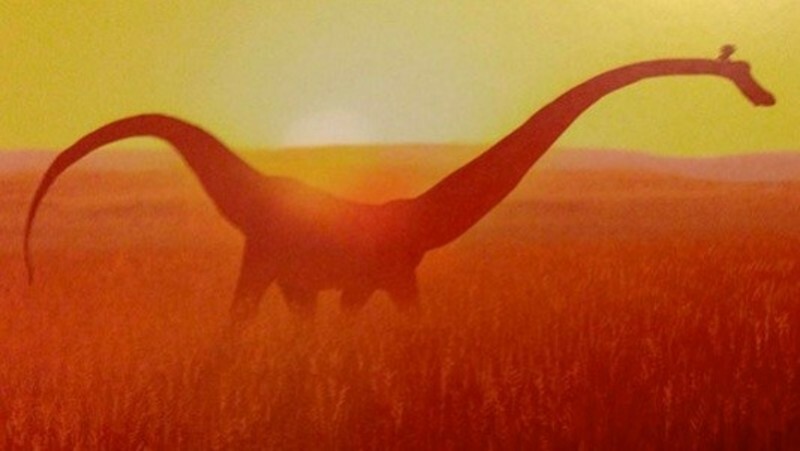 Disney-Pixar's "The Good Dinosaur" is scheduled to be in theaters May 30, 2014. A Monsters University short, "Party Central," will be precede the full-length animated feature screening. "Party Central" has Mike and Sulley at their Monsters University fraternity, Oozma Kappa, making sure their frat party is epic.